P0sixspwn download links for iPhone, iPad, iPod Touch.  Home  P0sixspwn  P0sixspwn Download  P0sixspwn iOS 8  P0sixspwn download links for iPhone, iPad, iPod Touch. 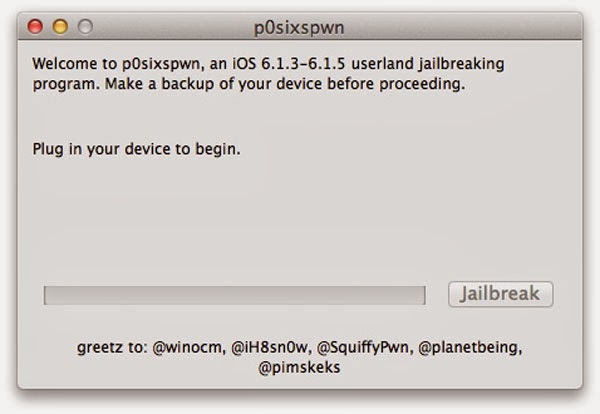 Jailbreak performed by a utility P0sixspwn, is unattached . This means that once jailbroken after reboot the machine retains all its properties and does not need to connect to a computer. P0sixspwn installs hacked standard device application store Cydia. With it, you can perform on the iPhone, iPad and iPod touch actions , which are not authorized Apple default download tweaks unofficial software and change themes. Could you please help me? I only get the message "Rebooting device..." for a long time and nothing else happens. I'm tryingto jailbreak an ipod 4with 6.1.5. How is the current situation with jailbreak 6.1.5? help me please why its getting error its said "The Procedure entry point sqlite3_wal_checkpoint could not be located in the dynamic link library SQLite3.ddl.